Hey all! 18 more days of school left here! I feel like its forever. It was so crazy hot (91!) in my classroom on Friday. I hope it settles down more. In any case, for now I am keeping up the routine. 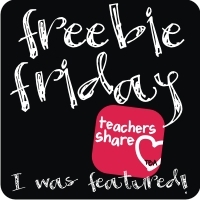 I hooked up to Friday Freebies at Teaching Blog Addict and Manic Monday at Classroom Freebie! I linked my Swimming into Summer preview freebie up and you should be able to find tons of other great free stuff! Click on the picture below to head over to Friday Freebies or Manic Monday and take a look! Youre so welcome ! Thank you!